**JBay just finished, but I’ll include that at end of year stats. 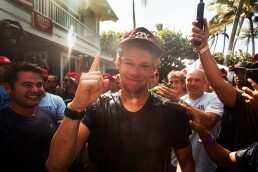 34 surfers have ridden 3065 waves across five events and the world champ, John John, has only caught 53 waves of them. On the other end of the scale sits Julian with his bung wing, he's somehow managed to paddle into a whopping 154. There's been almost $3mil direct debited into 34 bank accounts across the globe so far this year. Italo being the run away at the moment, with Julian a close second. 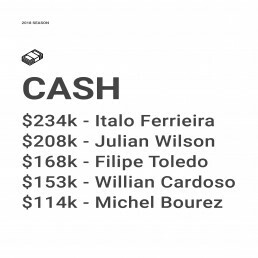 In fact, there's only 7 surfers who've earned over 100k this season. 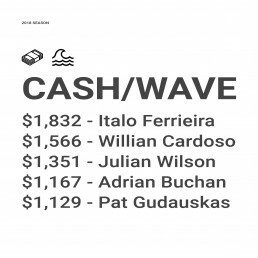 To make it all work, we went and grabbed the data around how many waves everyone has caught, the prize money they’ve won (via World Surf League site). We pulled data from surfers who are on tour and scrapped the wildcards, except Mikey Wright – he’s basically full time anyway. From there it was just playing around in a spreadsheet to get the figures dialed in and see who was what where and played around with a few formulas to help get some insights around it all. Below are some stats on our dual event winner, Italo, along with defending world champ John John. 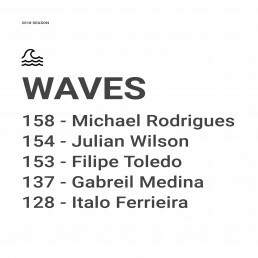 We also threw in Michael Rodrigues, as he’s got the lowest Cash Per Wave number due in part to catching 158 waves this year. 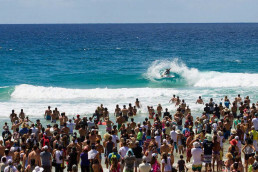 So that’s a decent wrap up on who’s earning what and how many waves are getting caught this year on the World Surf League tour. There’s a lot more data available and if you’d like access to it all I’ve prepared an easily downloadable PDF that has some statistics along with the entire data set. If you’d like the PDF, just throw your email in the subscribe box to the right (or below if you’re on mobile).